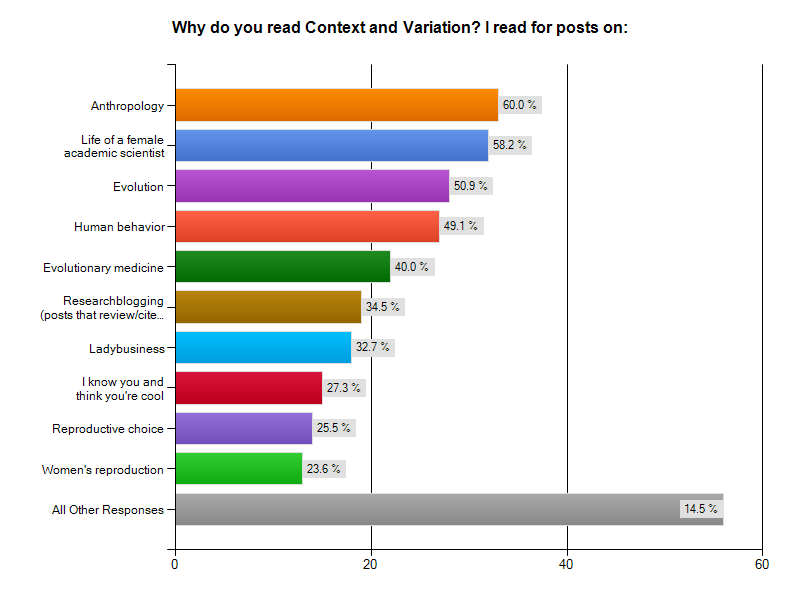 Thanks to Ed Yong and a number of other very smart people, I was inspired after Science Online 2011 to perform a survey of my readers to figure out who comes here, why they do, and what they’d like to see more of. I enjoy engaging with other science writers, bloggers, and fellow anthropologists, really I do. But I hoped to gain some insight into how I might reach an even broader audience, to increase awareness of the kinds of science I do and that I find interesting. There are political ramifications to having a lay population completely unaware of the basic functioning of the female body, particularly around reproduction, when we have so many strong feelings about it. Feelings will always win in a one-sided fight: put it up against evidence, though, and at least some people will start to operate more rationally. Figure 1. My hits from the first day of #scio11 to yesterday. Eep. 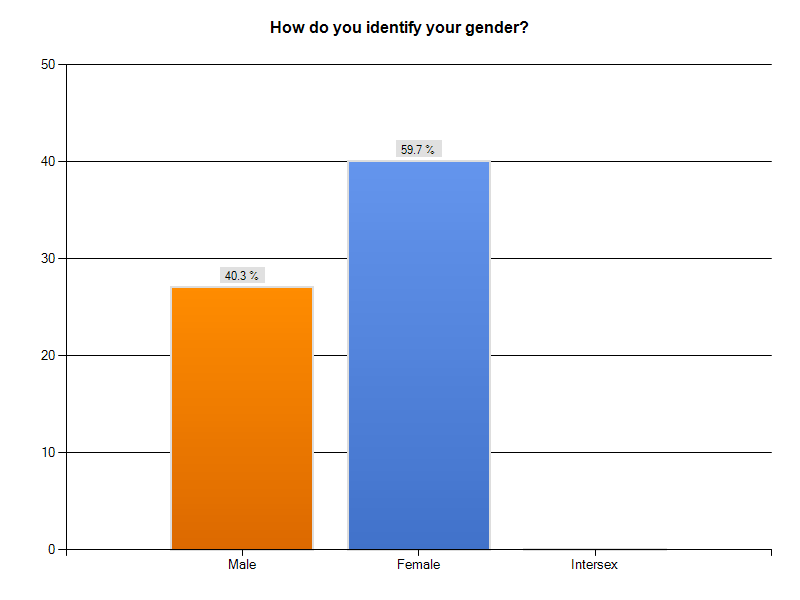 My survey went from the 17th of January until the 21st or so; I stopped at sixty respondents. As you might imagine, my readership has changed. That said, I think I learned a lot from the survey, so I want to share it with you and see if we can broaden the conversation. I regret the way I wrote the ethnicity question. 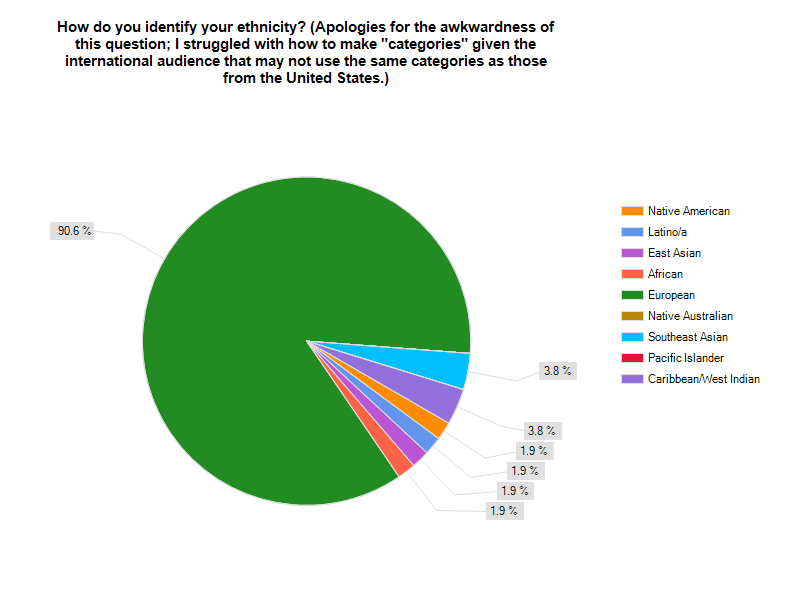 I was trying to figure out how to ask people’s ethnicity from a more global perspective — that is, I couldn’t exactly write European-American, African-American, etc, because I have readers from other countries. These ethnicities also mean something very different depending on where you live. This led to confusion in almost ten respondents, many of whom were white but not all, who just put in the “other” section that they were white/black/mixed race/etc. Two last questions in this section were about the respondent’s education and vocation. Here is what I got. 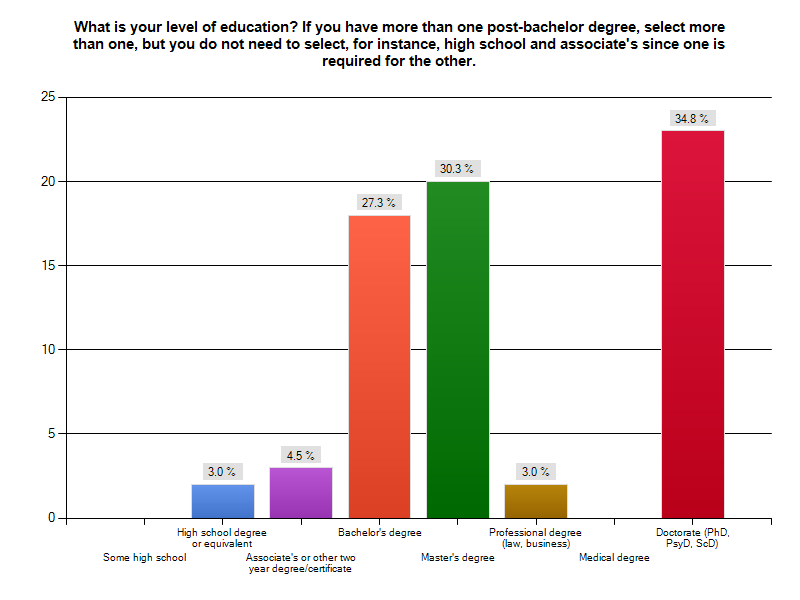 A full third of respondents have PhDs. Damn, people. But I was pleased to see at least a handful of folks that were still in college (and I hope desperately that they aren’t just my current semester of students!). People read people who are like them. If you want people who are not like you to read your blog, you probably have to step out of your comfort zone. This is significant for a number of reasons. 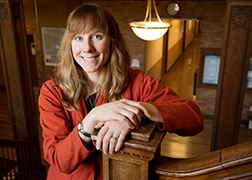 More prominent women sciencebloggers, for instance, likely means more female readers. Same goes with more sciencebloggers of color, of different sexualities, different physical capabilities, different countries, different ages. And since sciencebloggers can draw people into science, can excite them, inspire them to stay when they are feeling scared, and otherwise mentor them, having broader representation in scienceblogging is a Very Good Thing. Conversely, if I want to reach something other than the white-female-straight-middle-class-academic audience, I need to be doing something different than what I’m doing right now. Some of that lies in promotion and marketing, but more of that likely has to do with voice, style and content. Most of this section of the survey was freeform response, but I did have a few graphable questions. 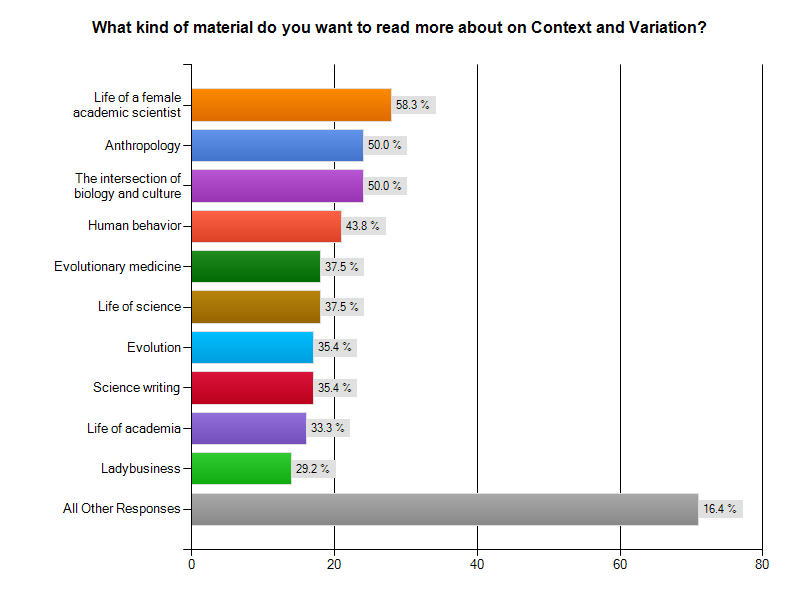 What I find interesting here is that readers mostly want to read about the life of a scientist stuff (there are many women sciencebloggers who do this more regularly and eloquently than me), and more plain-old anthropology. Ladybusiness, reproductive choice, women’s reproduction, not nearly so much. On the one hand, I think I would like to expand my writing a bit to try to write posts that have an anthropological perspective and broad appeal. On the other, if ladybusiness isn’t your top priority, readers, you don’t know what you’re missing! I’d like to think that’s what I demonstrated last week with my iron-deficiency anemia post. If I weren’t scrabbling for tenure I could probably write a post a week on anthropological perspectives on women’s health like that post. Men and women commented on, and wrote on, that post. It made it to reddit, a few great feminism blogs, and lots of other non-science individual bloggers and livejournalers. So ladybusiness is here to stay, but I am going to try to expand my reach. Anthropology is a discipline most don’t get in high school, so most people know next to nothing about it. It would be a great thing if I could expose more people to how cool the field can be. Explain more terms, go for a less scholarly tone. Many of you found me through Twitter, so continue using that medium. Try for less of a wall of text (break it up, use pictures, etc). Use more keywords so they get Googled. Write “basics” posts that can be referred to again and again by laypeople, teachers and students. Use surveys and other interactive widgets. I think those of us who want to write for a broader audience, if we can inspire this feeling in our readers, even some of the time, we’re doing well. Why do you read any science blog? How do you think we can get your friends to read us too? If we could inspire people to reach for other connections, with material and people they don’t know, instead of the zone of comfort they do know, it would be a marvelous thing. I don't read many blogs with actual science content, preferring instead ones about life as a scientist. I was delighted to discover this blog (I'm sure you can guess why) and now I'm rather interested in learning more about anthropology and the science of ladybusiness. So I guess you encouraged at least one person to branch out a little bit! 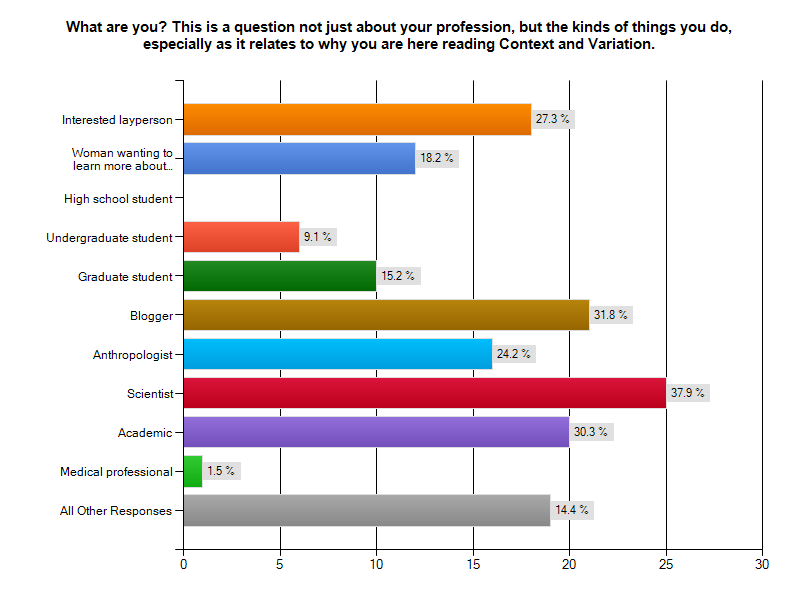 I'm fascinated that such a high proportion of your readers have PhDs, but none of your respondents had an MD. What do you think explains the lack of MDs here? I think they are missing out, given the ladybusiness topic at hand, I bet that most MDs would learn stuff on your blog. And you can't expect me to believe that there aren't MDs reading science blogs. Why not yours? I just came here and I'm now following you. Two reasons– I just discovered Google reader, and I read ResearchBlogging every once in a while and I was seriously impressed with the ladybusiness I found here. I read science blogs all the time, always looking for new ones. I'm a young aspiring science writer, looking for my niche to write about, so this research for me. Also, I love reading about science. As for reaching out, twitter seems to be good, but I'm trying to figure this question out myself. I read this blog because I'm a physical anthropology grad student but I'm focusing on bones, so I like to keep in touch with the rest of the field. Finding and reading journal articles is time consuming, but I like the “compressed” version of this blog. Similarly for other blogs I read, it's often to read about life as an academic and also to read about the science that's going on outside my field, that I might otherwise never stumble upon. As for getting to more people, Twitter is good as are all the social content sites (so basically, word of mouth v 2.0). I read science blogs a lot because I'm an environmental educator interested in learning how to communicate that “ivory tower” research can be meaningful and relavent to the general public. I would encourage you to blog/tweet about what you feel passionate about and the readers will find you. That's why your lady biz post was so popular – it was the passion behind it. Don't worry too much about reaching out. I'm confused. Several of your graphs include a category “All Other”, which is generally a long gray bar which is longer than most other categories. Yet it is labeled with a percentage which is smaller. So which is “All Other” – bigger or smaller? EGF: I can guess :). Anne: I also find this interesting. I wonder if that has changed since the hits explosion or not. roes, CIV and Apple: Thanks for your comments! It's interesting so far to see the readers all have some connection to science. JoOwl: I noticed that too. 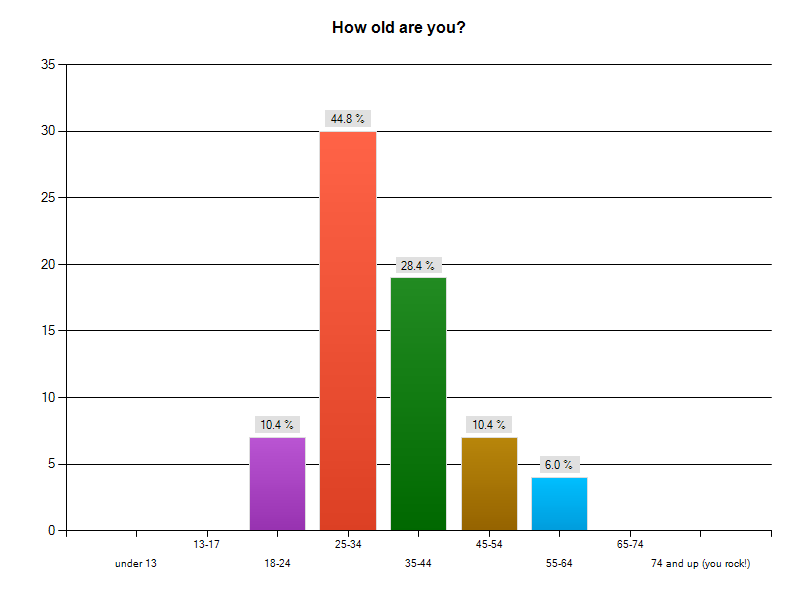 These are the graphs supplied by SurveyMonkey. The percentages are correct, the absolute value is incorrect. You'll have to forgive my laziness in not making better graphs myself :). Hi, I came over after listening to your interview with Prof. Hawks. I am a lay person interested in anthropology (have had some classes at a university) as well as a member of several online anthropology groups. I also read several other blogs that deal with anthro and/or science. Most of my interest is in early and pre-humans, the migration and the issues they faced in thier lives. I came here via a link on feministe. Loved your iron anemia post! I hope you do more of those. Clear, easy to understand, with pictures. I am an artist, with a college education, but I enjoy reading about science, and especially women's perspectives. You could get lay feminists by posting links to posts like the Fe anemia on their Sunday `strut your stuff'. I like reading science blogs and am always looking for good ones…that aren't sexist. EarthandIce and Anonymous, that's great! And Anon, that's a great idea. I am thinking of contacting them to see if we can do some cross-posting or something to get feminists and scientists to engage with each other more. This is the only one I read! I daily email interesting things from my blogreader to friends, so now you're included in that list! This is somewhat out of date but I'm hoping you'll still read this. I discovered you while following links from GladRags, the link to your non-connection between menstruation and anemia. I'm staying because I'm absolutely fascinated by the rest of what I found here! I read everything, sort of like an addiction, but I am particularly (and perhaps coincidentally) interested in science/anthropology. Anything that falls into that category I will likely stalk with fervor. Most of the people I know of that read blogs and news from the internet do so as much by tripping over something interesting as they do by purposefully looking. Get yourself out there as much as possible and slowly (but hopefully incrementally better) you should find yourself with more readers!